This page provides a detailed list of 's 2016 pumpkin festivals, weigh-offs and various state-wide and county pumpkin fairs and events. Click here to see the listings of pumpkin patches, corn mazes and farms in or just scroll down the page! ALWAYS call before you go to confirm the info, they don't always report changes to me! The dates provided give an approximate - but click on the link to the event's website (or call) to find out this year's exact dates! Also see your state's page for pumpkin festivals held by individual farms. We have loads of related resources here, too. 2015 broke the previous US records at the annual Harvest Fest in Stillwater, with the prize-winning pumpkin weighing in at 2,185 pounds, on Oct. 10, 2015, grown by Josiah Brandt of Rudolph, Wisconsin. Second place for North America. 2,145-pound pumpkin grown by farmer Gene McMullen from Streator, Illinois. It was the world's third-largest pumpkin, according to the Great Pumpkin Commonwealth (GPC) officials at the Wine and Harvest Festival in Cedarburg, Wisconsin. The current world record holder is still the 2,323-pound pumpkin from Switzerland in 2014. 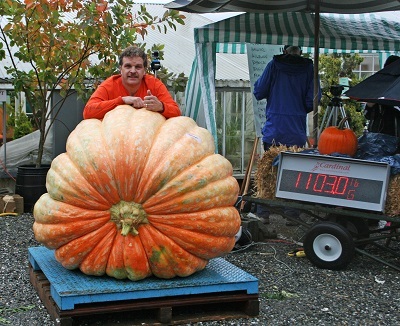 2014: John Hawkley, with a 2,058 pound pumpkin won the North American title at the Half Moon Bay Art and Pumpkin Festival in California, A close second was Peter and Cindi Glasier of Uesugi Farms Pumpkin Park in San Martin, California grew the 2nd heaviest pumpkin ever grown in America at 2036 lbs. The world champion in 2014 was a 2323.7 pound giant pumpkin grown by Beni Meier weighed at the European Championship Pumpkin Weigh-off in Germany. 2013 and 2012 both broke records: Ron Wallace from Greene, RI, grew a pumpkin that weighed 2,009 pounds, making both the largest pumpkin in history, and also the largest fruit (pumpkins are technically a fruit) ever grown in the world. The pumpkin was weight at the Topsfield Fair in Topsfield, MA. The largest pumpkin in 2011 weighed 1,818.5 pounds and was grown by Jim and Kelsey Bryson from Ormstown in Quebec, Canada. 2010 had a record breaker: Chris Stevens of New Richmond, Wi. brought his 1810.5 pound pumpkin, to the Stillwater Harvest fest in Stillwater, Minnesota, on October 9, 2010. So for 4 years in a row, the pumpkins were progressively larger each year!! So much for the effects of heat, drought and global warming on pumpkins! 600 School Street (high School), Norphlet, AR 71759. Phone: 870-546-2781. Email: jwhite@norphlet.k12.ar.us. Directions: Take the Norphlet exit from highway (scenic 7), follow exit to the Norphlet High School (Hwy 335), parking by the old gym. And for a map to our farm, click here. Crops are usually available in October. Open: Saturday, October 25th 5:00 pm until 11:30 pm Monday, October 27th 6:00 pm until 9:00 pm Tuesday, October 28th 6:00 pm until 9:00 pm. Payment: Cash, Check. For many more in California, click here! Auburn Weighoff - October - see their website for this year's date, 10 am to 4 pm. Auburn, CA. Directions: Held in the recreation park. Loads of events for the whole family, and contests you and your children can enter! Scarecrow Decorating Contest, Giant Pumpkin Weigh Off, Recipe Contest, Costume Parade, Vendor Fair, Kids Crafts and LIVE MUSIC. 9950 Elk Grove-Florin Road, Elk Grove, CA. Directions: Held in Elk Grove Regional Park. FREE Admission, $5 Parking. 3064 1/2 Ridgeview Drive, Altadena, CA 91001. Phone: (626) 797-3276. Email: dannysfarm@yahoo.com. Directions: Exit the 210 Freeway at Windsor/Arroyo in Pasadena and go North on Windsor. Go right on Ventura, left on Casitas, left on Altadena Drive and left on Ridgeview. Click here for a map and directions. Crops are usually available in October. Open: Fall Pumpkin Festival is 10/29 to 10/30 4:00 to 7:00 pm. Payment: Cash, Check, Visa/MasterCard. Our petting farm is wheelchair accessible and our staff is fluent in American Sign Language. We welcome ALL children, with or without disabilities. IDES Grounds, 735 Main Street, Half Moon Bay, CA. Phone: 650-726-9652. Email: tbeeman@miramarevents.com. Halloween arts and crafts, specialty foods, blockbuster entertainment, a Great Pumpkin Parade, a haunted house, the giant weigh-off of champion pumpkins, and contests for pie-eating, carving and costume. Admission is free. Presented by the Half Moon Bay Beautification Committee. Highland Hall Waldorf School Pumpkin Patch Harvest Festival - Saturday in mid October - see their website for this year's date, from 11:00pm-4:00pm. Highland Hall Free community event Garden full of organic pumpkins Harvest Crafts Build a "Scarecrow" Live Fiddle Music Square Dancers Pumpkin Patch Pantry Old Fashioned Games & much more! 17100 Superior St., Northridge, CA, 91325. Phone: 818-349-1394. Email us at: mturner@highlandhall.org. Irvine Park Railroad - "Great Pumpkin Weigh Off" on Saturday, September 24th, 2016, starting at 11 am! The Flower Farm Nursery 9280 Horseshoe Bar Road, Loomis, CA 95650. Phone: 916-652-5650. Fax: 916-652-5650. Email: theflowerfarmnursery@yahoo.com. Directions: Going east toward Reno from Sacramento on highway 80, take Horseshoe Bar Road exit & go left. Take left at the T. We are approximately 4 miles at corner of Horseshoe Bar Road & Auburn-Folsom Road Going west on highway 80 from Reno to Sacramento, take Horseshoe Bar Road exit & go right. Take left at the T. We are approximately 4 miles at corner of Horseshoe Bar Road , & Auburn-Folsom Road. Click here for a map and directions. Crops are usually available in October, December. Open: Saturdays and Sundays in October 10 am to 3 pm. Payment: Cash, Check, Visa/MasterCard, Discover, AmEx. The Flower Farm is a relaxing, working farm with a u-pick flower field; a coffee house cafe with farm-fresh offerings, homemade pies & cakes, as well as coffee drinks, Italian sodas & smoothies; a full nursery with plants, organic soil amendments and fertilizers, and a gift shop with work from local artists and more. 14485 Monterey Hwy., San Martin-Morgan Hill, CA. Phone: 408-778-7225. Email: dianez@uesugifarms.com. Includes a 24" train ride, even with a tunnel. Directions: Click here for a map. From the North: South on US 101 toward Morgan Hill Exit Tennant Avenue right Left on Monterey Hwy. 2 miles down on right Turn right into the pumpkin patch; From the South: North on US 101 toward Morgan Hill Exit Tennant Avenue left Left on Monterey Highway 2 miles down on right Turn right into the pumpkin patch. We have two Caltrain stations within 2 miles of our Pumpkin Park: see the Caltrain web site for scheduling details http://www.caltrain.org. Open: 9 am to 6 pm; click here for the current calendar of events. Borchard Farms Home Ranch, 142 Rodgers Road, Salinas, CA. Weighoff starts at 9:00 a.m.
SLO County Great Pumpkin Contest c/o San Luis Obispo County Farm Bureau - mid October - see their website for this year's date, from 6:30 pm to 8 p.m. Downtown SLO Farmers' Market, Chorro Street, San Luis Obispo, CA 93401. Giant pumpkins will once again take over Chorro St. in San Luis Obispo as grower's county-wide test their growing skills to see who can produce the heaviest giant pumpkin in the county. Last years winner was 714 pounds. The contest will be held on Chorro St. during the San Luis Obispo Downtown Association's Thursday Night Farmers' Market, between 6:30 p.m. and 8 p.m.. Giant pumpkins can grow between 200 and 1,500 pounds, with the world record pumpkin weighing in at 1,502 pounds. Kingsburg, CA.. Anyone who weighs their pumpkins in at the Selma Flea Market public scales at Highway 99 and Mountain View Avenue between 8 a.m., Monday, October 27 and Wednesday, October 29, 4 p.m. is eligible to compete for the "Great Pumpkin" title and earn a $1,000 prize. For further information, call the sponsoring Kingsburg District Chamber of Commerce at (559) 897-1111." Bancroft Park, 24th and West Colorado Avenue In Old Colorado, Colorado Springs, CO. NOTE: I haven't been able to verify this farm's information. If you have been there or know their website's address or email address, could you let me know? Click here to write to me! Come join us to see giant pumpkins and sign up for free giant pumpkins seeds to be distributed in early spring. Start to grow your own giant pumpkins next year in your backyard garden. Jared's will feature a straw maze for the children along with balloons and popcorn. There is a pumpkin decorating class for kids from 9-11:00 am. Space is limited and cost it $15 per child which includes a pumpkin, decorating supplies and instructions. Please call the nursery at 303-979-6022 to pre-register. St Michael's Preschool 19099 E Floyd Ave , Aurora , CO 80013. Phone: (303) 690-6523. Directions: Click here for a map and directions. Crops are usually available in October. Open: Saturday, October 25th 9am to 7pm and Sunday, October 26th 8am to 4pm. Payment: Cash, Check. Craft Fair includes more than 40 vendors selling Jewelry, Woodcrafts, Ceramics, Holiday Decorations, and much more. Pumpkin Chuckin Festival - a weekend in early November - see their website for this year's date, Contest commences 8:00am each day. Q. Is there a contest on Friday? Q. What time does the 'Chunk' start? Q. When should we arrive? Q. What are the GPS Coordinates of the Chunk location? Q. Is there an admission fee? Q. Should we bring blankets or chairs? Q. Will food vendors be available? Q. How do we enter a machine? Q. What are the rules of the Chunk? Q. How are the machines classified? 750 Starkey Road, Largo, FL 33771. Phone: 727-586-0108. Fax: 727-586-6378. Email: admin.lar@smacommunity.net. Directions: On Starkey Road between Ulmerton and East Bay. Crops are usually available in October. Open: Event is October 18th only from 10am to 3pm; Proceeds benefit "Woodlawn Community Academy" which is a not for profit organization that specializes in educating children with learning disabilities. Payment: Cash, Check. Didier Farms Great Pumpkin Weigh off - late September THRU October 31, Hours 7 days a week 9-7 p.m.
corner of First and Jefferson across from National City Bank, Morton, IL. Phone: 888-765-6588. 14100 State Route 4, Auburn, IL 62615. Phone: 217-438-3126. Email: AuburnCornMaze@yahoo.com. Directions: Click here for a map and directions. Crops are usually available in September. Open: September 13th - October 13th only: Saturdays 10 to 6, Sundays 12 pm to 6 and Monday, October 13th only 10 to 2. Corn maze is open only on Saturdays and Sundays from September 13th - October 13th (Monday Columbus Day) Corn Festival Dates: September 20th-21st and 27th-28th Hours: Saturdays 10 to 6 and Sundays 12 pm to 6. Payment: Cash, Check. 3rd annual A-MAZE-ing Corn Festival Dates: September 20-21 and 27-28 with this year's theme "Down on the Farm". 1202 East 38th Street, Indianapolis, IN. Does anyone have contact or current information for this event? If so, please write me! 13210 US Highway 30 West, Fort Wayne, IN 46818. 29703 Post Road, Saint Leon, IN. Phone: 812-576-3177. Open: first 3 weekends (Saturdays and Sundays) in October; Call for hours they're open, as it varies. Said to be one of the region's largest pumpkin festivals, drawing 30,000 annually. It is open the first three weekends in October. Pick their own pumpkins in the field. Admission is free. pumpkinfest@anamosachamber.org The Pumpkin Capital of Iowa (named by the Iowa legislature in 1993) for great family fun at the annual Pumpkinfest and Weigh-off! The event is scheduled for 1st Saturday of October with events scheduled throughout the day including the Ryan Norlin Pumpkin Weigh-off, Pumpkinfest Parade, pumpkin carving exhibits, food and craft booths, pumpkin recipe contest, games, tractor pull and much more! 13978 Hammerand Road, Sherrill, IA 52073. Phone: 563-552-2866. Email: oldagiron@yousq.net. Directions: Take highway 52 North to Sageville. Turn onto Sherrill Road Follow for approximately 5 miles. Watch for Signs!. Crops are usually available in October. Open: October 2-3, 2010 from 10AM - 5PM, see their website for other year's date., Payment: Cash, only. Threshing, tractors, gas engines, potato digging, gourds, straw bales, miniature bales, home made ice cream, many activities for the kids. Smoky Hills Visitors Center, 2660 E. Hobbs Creek Road, Assaria, KS. Directions: South of Salina. Exit 82 or 78 off of Interstate 135. Two miles south of Assaria off of Old Hwy 81. Follow "buffalo" signs to Smoky Hill Bison's entrance gate. Smoky Hill Bison's Maze and Pumpkin Patch is the official Kansas giant pumpkin weigh-off contest site for the Great Pumpkin Commonwealth international organization. Time: 10:00am Entertainment: Special food and entertainment Saturday besides the maze, rides, and games available during October weekends. And October 6 & 7 is our "Salute to our Military" weekend, so all active enlisted military personnel get in free to the maze activities by showing their military ID. 1225 Piney Grove Rd, Nancy, KY, 42544. Phone: 606-871-7745. Corn maze, petting zoo, hay rides, gem stone mining, buffalo.This will be a GPC sanctioned event to be held on Sat, the 29th of September. Bear Wallow Farms is a very, family oriented site, and we will have some monster pkns at the weigh-off. There are commitments from several Ky. growers, plus giants coming from WV, GA, and maybe a couple other states. We hope to set a new KY. state record at this event. Come see a 1100# pkn!!! East Baton Rouge Parish. Open: October 12, 13, 26 & 27 from 6:30 pm to 10:30 pm. Haunted Hayrides, Haunted House, NEW Kiddie Village in our Lighted Rodeo Arena with games, Pony Rides, Live Bands each Night on the Lake, Food, Fun and Family Friendly entertainment. Pay One Price for all activities: $10 Ages 12 and older; Ages 5-11 $5, Little Ones ages 2-4 $1. Contact Betsy Barnes or Donna Hebert for information (225)261-4430. Email: wanetirilakes@yahoo.com. Family fun and learning, traditional crafts, pumpkin carving, great live music, animals, games, and more. Times: 10:00. a.m. - 5:00 p.m. Fees: $10 a carload. Location: Wells Reserve, Laudholm Farm, 342 Laudholm Farm Rd, Wells. Entries are available for all age groups with great prizes! Learn about the origins of Halloween and where pumpkin carving came from. Fees: $3 per pumpkin. Times: 10:00 a.m. - 2:00 p.m. Location: 363 Durgintown Rd, Hiram. A weekend long festival including a scarecrow contest, pumpkin decorating, scavenger hunt, ghost stories, marketplace and much more. Fees: Fees vary by event; some free. Contact: Frances Reed, Ogunquit Chamber of Commerce.. Agricultural History Farm Park, 18400 Muncaster Road, Derwood, Maryland - Old-time crafts, live music, food and tons of down-home on the farm fun. Families will enjoy potato digging, pumpkin painting, scarecrow making and gardening talks and demonstrations. Potato scramble, hay maze, gardening talks/demos, archaeological dig, pumpkin painting. See live farm animals, such as pigs, goats and working sheepdogs, enjoy storytellers and explore antique farm equipment. Admission is $10 per car. For more information on Harvest Festival call (301) 924-4141 or 301-721-0312 during event days. 207 Boston Street, Route 1, Topsfield, MA 01983. Phone: 978-887-5000. Directions: Route 1 north to the Fairgrounds on right, Topsfield, MA. Pumpkin weigh-off 8:30am in main Arena. Also, Beekeeping, milking demos, Pony Club competition, arts and crafts, Irish band, Country music, Thai fruit carving, magician. No pets allowed at fair! Lion's Club Building, Bellville, MI. NOTE: I haven't been able to verify this farm's information. If you have been there or know their website's address or email address, could you let me know? Click here to write to me! Andy Ts Farm, 3131 S. US-27, St. Johns, MI 48879. Phone: 989-224-7674. 5581 S Lake Shore Drive, Harbor Springs, MI 49740. Phone: 231-526-3276. Email: farm@pondhill.com. Directions: We are located 5 miles North of downtown Harbor Springs on M119. Click here for a map and directions. Crops are usually available in September. Open: Saturday October 4th 2008 from 10 to 4. Click here for current open hours, days and dates. Payment: Cash, Check, Visa/MasterCard. Monroe, MI. NOTE: I haven't been able to verify this farm's information. If you have been there or know their website's address or email address, could you let me know? Click here to write to me! Millennium Middle School, corner of Nine Mile Road and Pontiac Trail, South Lyon, MI. Weighing finishes 9:00am. Also see this page. Southern Minnesota Giant Pumpkin Weigh Off - September 27 - The weigh off starts at 10 am. Hamilton Farmer's Market, Hamilton, MT. Does anyone have contact information for this event? If so, please write me! Santa's Woods, 3764 highway 133, Blair, NE 68008. Phone: 402-468-5598. Email: WILDFLOWER@huntel.net. Directions: from Omaha take 680 north to Irvington exit. Take Hiway 133 (also called Blair High Road) north towards Blair - Santa's Woods is on the east side of the Hiway. It is well marked and approximately 7- miles from the Irvington exit.. And for a map to our farm, click here. Crops are usually available in September. Open: Educational event showcasing alternative agricultural products; Wine tasting and culinary demos; vendor sites available; Admission is free! Will be held September 20, 2008 from 9am to 4pm. Payment: Cash, Check. Calvary Chapel of Spring Valley's Annual Harvest Festival - from 5pm to 9pm on Friday, October 31st. 7175 West Oquendo Road - Las Vegas, Nevada, 89113. Phone: 702-362-9000. Open: from 5pm to 9pm on Friday, October 31st. >It is a Harvest Festival with carnival rides, game booths, lots of candies and food. All ages welcomed. The admission is free as are the game booths. Wristbands are available for purchase for unlimited rides. There are rides for older kids/adults and rides for the younger kids. All supervised for safety. Food is available for purchase. Free candy is handed out at all the game booths just for playing the games. Face painting too! There will be security guards as well as Metro police helping to keep things safe for the kids. Shuttles and parking are provided. Last year over 7,000 people showed up, and they're expecting 10,000 this year. Great fun! You can wear costumes but no scary/gory type of costumes, please. Rt. 13, Boston, NH. Does anyone have contact information for this event? If so, please write me! Hopkinton Fair Ground, Contoocook, NH. Does anyone have contact information for this event? If so, please write me! Downtown at Main Street, Laconia, NH. Phone: 603-358-5344. Email: centerstage@nh.acadia.net. Open: Each fall, the city of Laconia, New Hampshire (it moved from Keene in 2015), comes alive with the sights and sounds of this annual celebration of community. Thousands contribute to the spectacle by bringing their own hand-carved pumpkins. The sight of more than 25,000 brightly lit jack-o-lanterns lining Main Street and towering over the square is an unforgettable experience. the Festival has become famous for its status as the holder of the world record for most jack-o-lanterns lit at the same time in one place. But the Keene Pumpkin Festival isn't just about setting records…it's about bringing people together in a spirit of community and participation. Admission is free. Off-site parking with shuttle bus service is available and is strongly recommended. Milford Oval, Milford, NH. Phone: 603-672-4567. Email: milfordmainstreet@verizon.net. Directions: The Great Pumpkin Festival is held annually in Milford, New Hampshire. Milford is located about 15 minutes northwest of Nashua NH and is accessible via NH Routes 101A, Rte 13 and Rte 101. The activities all take place on or around the Milford Oval at the junction of Routes 101A and 13. Rindge Center, Rindge, NH. Does anyone have contact or current information for this event? If so, please write me! Lafayette Street, Rochester, NH. Does anyone have contact or current information for this event? If so, please write me! Blackwood Pumpkin Festival - early October - call for this year's date, 11 a.m to 5 p.m. Rain date 10/8. Black Horse Pike, between Church St & West Lake Rd, Blackwood, NJ. Phone: 609-405-0306. Food, craft & specialty vendors, kids activities, entertainment. Burjan's Pumpkin Festival - weekends only starting the last weekend in September and through October. 524 Old York Rd, Flemington, NJ 08822. Phone: 908-782-7654. Fax: 908-782-9502. Email: burjansfarm@yahoo.com. Open: Saturday and Sunday from September 27th through October 26th; 9 am to 6 pm; Hayrides from 11am to about 5pm. Directions: Located on Old York Rd. behind the Hess Gas Station in Three Bridges NJ. And for a map to our farm, click here. corn maze, pumpkins, pumpkin patch-pick in the field, pumpkin patch- already gathered from the field, straw or hay bale maze, child-sized haybale maze, prepicked produce, gift shop, snacks and refreshment stand, restrooms, picnic area, tractor-pulled hay rides, face painting We open at 10:00 AM and hayrides begin between 11:00 AM and 12 PM. The last hayride goes out around 5:30 pm. Payment: Cash, only. Click here for our Facebook page. Halloween Festival - Friday October 31, 2008 from 2:00 to 08:00 Saturday November 01, 2008 from 10:00 am to 08:00 pm. Click here for current open hours, days and dates. Salem County Fairgrounds. Rte. 40, Woodstown NJ 08098. Phone: 856-765-0118. Open: in 2014, October 10th to 12th, Friday, 5 pm to 10 pm, Saturday from 10 am to 8 pm, Sunday from 10 am to 5 pm. We have $4,000 in prize money for 2014 Big Pumpkin Weigh-Off. Weigh-off is on Sunday, October 12 starting at noon. Check in 9:30am to noon. First Place wins $1,500, 2nd $1,000.00 prize money paid up to ten spots. Tuckerton Seaport, 120 West Main Street, Tuckerton NJ. Phone: 609-296-8868. Pirates and sea captains long lost at sea wander the boardwalk for a night of screams! Hayrides, refreshments, story telling and a non-scary pumpkin patch for the little ones. Admission charged to non-members. 370 East Veterans Highway, Jackson, NJ 08527. Email: forestrycenter@gmail.com. Directions: our directions - Mapquest directions. Meet Smokey Bear, Woodsy Owl, and Treeture the squirrel. Other activities offered include pumpkin painting, hikes through the pinelands forest, birdhouse building, crafts, forest products, sawmill, autumn hayrides, and many other activities. We hope to see you at Fall Forestry Festival! For Families, groups, and scouts. Over 40 Nature-themed Exhibits, Demonstrations, and Tours. Free Parking and Admission! Girl Scout & Boy Scout Programs Scouts may attend Fall Forestry Festival to help fulfill badge requirements. Please see this page for more information on badge requirements covered. To be added to the scout mailing list, email the FREC with “scout mailing list” in the subject area. There are no reservations for scout programs. Cooperstown Weigh-off - Pumpkin Regatta – see their website for the exact date. In the parking lot of Doubleday Field, Cooperstown, NY. 1543 Maple Ave. in Elmira, NY. Bradley Farms Pumpkin Weighoff Phone: 607-732-0561. Washington Square Park, Oswego, NY. Hicks Nurseries Great Pumpkin Weigh-off - first Sunday in October - see their website for the exact date, 12pm. 100 Jericho Turnpike, Westbury, NY 11590. Phone: 516-334-0066. Winners in previous years have grown pumpkins weighing 876, 920 and 1030 pounds. Prizes will be awarded to the top three pumpkin growers. In addition there will be numerous fall activities underway at the nursery, including hayrides, farm animals, roasted corn, kettle corn, the Otto the Ghost story and Otto in person. The nursery is handicap accessible throughout. The Bayberry Nursey, 50 Montauk Highway , Amagansett, NY. Secor Farms, 63 Robinson Lane, Wappingers Falls, NY. 4844 Sugartown Road, Great Valley, NY. Weighoff at noon. Phone: 716 699 2205. Springdale Farm Harvest Festival - Festival: September 22: 10am – 3:00pm. Pumpkin patch event: October 8, 1pm to 3pm. Springdale Farm, 700 Colby Street, Spencerport, NY 14559. Phone: (585) 349-2090. with scarecrow displays, a hay castle, petting zoo, fishing, crafts, live bluegrass music, horse-driven carriage rides, etc. 10 am to 4pm (Colby St, Ogden). They have many other activities, animals, robotic milking parlor, bakery. Highlights include autumn adventures such as scarecrow displays, pumpkin sales, pedal tractors, corn husk teepee, petting zoo and wagon rides! The farm will be selling concessions, including hotdogs, hamburgers, salt potatoes, beverages, homemade pies, apples, cider and donuts. Wheatfield, NY. Does anyone have contact or current information for this event? If so, please write me! World Pumpkin Confederation (WPC) - early October - see their website for this year's date, , 10 am. The Great Pumpkin Farm, Rte 5, Main Street, Clarence (in Buffalo), NY. Fall Festival And Trunk Or Treat - Sunday, October 26 from 5 pm to 7 pm. 5301 Celebration dr., Hope mills, NC 28348. Phone: (910)424-8589. Directions: In Cumberland County; Take exit 41 Off of Interstate 95 and head away from Hope Mills. Go about 1.5 to 2 miles and take a left onto Celebration drive, event is on the right. Crops are usually available in October. Open: Saturday, October 13th, From 6:30pm to 10:00pm On Saturday, October 13th, the Grays Creek FFA Chapter will hold it's 5th Annual hayride. There will be a tractor-driven hayride, Pumpkin Painting, Face Painting, and many more family-oriented events. The time is from 6:30pm to 10:00pm, and everyone is invited! For more Information and directions, call (910)-424-8589 ext. 311 Payment: Cash, only. Elkin Municipal Park Hwy 268 West, Elkin, NC. Directions: I-77, exit 82, West on 67, left on Elm, right on Bridge & left on Standard Street. Will be located in the Smith Phillip parking lot. Festival: September 26th – 30th. Ohio Valley Giant Pumpkin Growers (GPC) - October - call for the current date, 10am – 1pm. Parks Garden Center, Canfield, OH. DIRECTIONS: Parks Garden Ctr. Is 4 miles SW of Canfield, Oh on State Route 62. Canfield is SW of Youngstown. Phone: (330) 533-7278. 6494 Martinsburg Road, Mt. Vernon, OH 43050. Phone: 740-392-6494. Email: providencefarm_ohio@yahoo.com. Directions: St. Route 586 (Martinsburg Road ) 5 miles south of Mt. Vernon. 4 miles north of Martinsburg. From the south- Route 62 north to Route 586 in Martinsburg. From the north- Route 13 south to Mt. Vernon, 586. And for a map to our farm, click here. Crops are usually available in October. Open: Saturday and Sunday , October 4th and 5th; noon - 6:00pm Festival is one weekend only. Click here for current open hours, days and dates. Payment: Cash, only. Family fun on an old landmark farm. Hayrides to the pumpkin patch. Farm animals/petting zoo. Kids activities. Shop with local arts and crafts vendors! Grab some lunch or dinner and tap your toes to some live bluegrass/country music. Sunday's bluegrass features McCoy Grass! rain or shine. free admission. Prices in 2008: $1- $5 for some activities. 867 North Bridge Street, Chillicothe, OH 45601. 159 East Franklin Street, Circleville, Ohio 43113. In the town center, at the intersection of Court St. & Main St, Circleville, OH. The Circleville Pumpkin Show. 1156 Oakland Park Ave., Columbus, OH. 1800 St. Route 7 NE, Yankee Lake, OH. 3488 Akron Road, Wooster, OH 44691. Phone: 330-264-0264. Email us at: dkramseyer@earthlink.net. Directions: State Route 585, 2 miles south of Smithville, OH And for a map to our farm, click here. Mazes, Home made French fries, farm animals, scenic hayrides, acres of pumpkins, Make your own life-sized scarecrows. Fall festivals starting the last weekend in September through the last weekend of October. Canby Giant Pumpkin Festival - early October - see their website for this year's date, 10am. Fir Point Farm, just 1 mile up the road from Hoffmans, Canby, OR. Fir Point Farm, Aurora, OR. Pioneer Park, Canyonville, OR 97417. Phone: 541-580-6083. Email: canyonvillepumpkinfestival@yahoo.com. Directions: I-5 in Oregon to Exit 198 Canyonville. East to Main Street. Pioneer Park is 1 block east of Main Street between 3rd and 5th Street. Parking is free. Additional free parking: Head East on 3rd Street (Tiller Trail Highway. Take second right and parking on the right. Walk thru bridge right into Pioneer Park. And for a map to our farm, click here. Crops are usually available in October. Open: Saturday 10 am to 7 pm. Payment: Cash, only. A festival, not a farm - pumpkins, Harvest Festival, tractor-pulled hay rides, apple cider, wine, parking provide free, snacks and refreshment stand, musical entertainment, carnival rides, cooking or fruit/veg judging, restrooms, picnic area, face painting, petting zoo, events at your location (call for info)Antique & Classic Car & Truck Show; Contests: Giant Pumpkin Weigh-In; Carved Pumpkin ; Scarecrow ; Pumpkin Recipe ; Tall Tales Competition ; Pie Eating ; Seed Spitting ; Food: Alder BBQ Salmon Plate ; Oktoberfest Plate ; Lots more Northwest Microbrews and Award Winning Henry Estate Wines Wildlife Safari Animal Shows & Presentations Live Northwest Regional Music. 14601 Arndt Road, Aurora, OR, 97002. Phone: 503-678-2455. Directions: I-5 south to Canby exit 282A. Turn left on Arndt Rd. Chinook Winds Casino, Lincoln City, Oregon. 16511 NW Gillhan Road, Sauvies Island, Portland, OR. The Pumpkin Patch - Phone: 503-621-3874. 7 Vo Tech Drive Suite 1E, Oil City, PA, 16301. Phone: 814-677-5914. Email us at: info@occhppumpkinfest.com. Located in Venango County. The OCCHP Pumkin Bumkin Fest is a celebration of the season, pumpkins & underappreciated art forms. The festival is an annual event held the weekend before Halloween in downtown Oil City at Justus Park. Lots to see and do. Craft/art/food vendors, haunted house, live entertainment, fireworks & more. It'll leave you "screaming" for more. Sam's Club Parking Lot, Altoona, PA.
At the apple orchard located about 5 miles south of Sioux Falls on Hwy 115. Sioux Falls, SD. Harvest Festival – late September . At the apple orchard located about 5 miles south of Sioux Falls on Hwy 115. Sioux Falls, SD. Saturday: 10-5pm, Sunday 12-5pm. Does anyone have contact or current information for this event? If so, please write me! Floydada, TX 79235. Phone: 806-983-3434. Costume contests for all ages, pie baking, pumpkin carving and coloring, pumpkin decoration, pumpkin pie relays, Cow Patty Bingo, seed spitting contest, Trunk or Treating, pumpkin bowling, pumpkin rolling, pumpkin guessing and pumpkin weighing are just a few of the activities offered during the extravaganza held each year on the 2nd weekend in October. Houston area - 7 Acre Wood's Thrill at the Mill - last Saturday of October from 4pm-9pm. 4401 N. Frazier , Conroe, TX 77303. Phone: (936) 890-2326. Email: carrie@carriescoffeemill.com. Directions: From Interstate 45 take exit 91 (Leagueline Road), go E. 2 blocks to Hwy. 75 (Frazier), go N. 2 blocks and 7 Acre Wood is a red and white country frontage located on the left side of the road. And for a map to our farm, click here. The festival includes: live bluegrass, performers, games and candy, scarecrow judging, mini golf, petting zoo, zip lines, and so much more. They also have pumpkins, pumpkin patch-pick in the field, pumpkin patch- already gathered from the field, straw or hay bale maze, prepicked produce, gift shop, snacks and refreshment stand, restrooms, picnic area, petting zoo, farm animals, birthday parties, school toursPayment: Cash, Visa/MasterCard, Discover. Allardt, TN. Phone: 931-879-9948. Email: cjeffers@www.york.k12.tn.us. Open: September 30 to October 01, 2005. In addition to the contest for the largest pumpkin, there are crafts, food vendors, pumpkin carving, pumpkin painting, music, games, car show, antique tractor show, motorcycle show, and other events. Free admission and free parking. Farmers and gardeners from several states show their prize pumpkins and other vegetables to compete for cash prizes and world record consideration at the weigh-off held annually on the first Saturday in October, this year on October 6. 5518 Liberty Grove, Rowlett, TX 75089. Phone: 972-475-5888. Directions: And for a map to our farm, click here. Crops are usually available in October. Open: Monday thru Wednesday 9:00am 6:00pm Thurs and Friday 9:00am 7:00pm Saturday from 9:00am 6:00pm Sun 10:00am 5:00pm Fall Festival on Saturday October18,2008 from 11:00am until 4:00pm. Payment: Cash, Check, Visa/MasterCard, Discover, AmEx. A visitor writes on September 23, 2011: "The 2011 Utah giant pumpkin growers weigh off is September 24 at 11:00 am"
Sam Mazza Farm Market, 277 Lavigne Road, Colchester, VT 05446. Phone: 802-655-3440. Email smazzafarms@comcast.net. Open: year round. Directions: Exit 16 off I-89, head north on Route 7, 1 ½ miles. Turn left onto Blakely Rd. Go 1 ½ miles, take left after bridge onto Lavigne Rd. Bring the whole family to watch giant pumpkins battle for the heavy weight title. Take a Hayride to the Pumpkin Patch or Get Lost in our Corn Maze while you're here. Enjoy lunch with Pizza Papillo and an apple cider donut or treat from our Bakery. . Weigh off will start at 1:00PM Mazza's typically has a food vendor available and a corn maze, fun for all. Non-members can get their veggies weighed entering the day of for $25, this includes VGPGA membership, however they will not be eligible for VGPGA prize money unless they are paid VGPGA members before August 15th. They would be eligible for any GPC prize money if applicable. Cabot Vermont. Apple pie baking contests for adult & juniors, craft fair, live entertainment & food sales. Family Entertainment, Food, Cash and merchandise prizes. Craft fair, live music, hand-pressing of cider, and other entertainment for adults and children. Slices of pie and whole pies, homemade soups, chili, sandwiches, hot dogs, etc. for sale. Free admission and parking. Silent auction, raffle, auction of prize-winning pies. 181 Blue Ridge Blvd, Roanoke, VA 24175. Phone: 540-977-5314. Email: jeterfarm@gmail.com. Open: Weekends September 27 to October 26: Friday 3pm to 6pm, Saturday 9am to 6pm, Sunday 12pm to 6pm. Click here for current open hours, days and dates. Directions: We're located on highway 460 at the Boeteourt/Roanoke County line at 181 Blue Ridge Blv, Roanoke, VA. Just one mile on the left past the Bonsack Walmart & Lowes heading towards Bedford. Click here for a map and directions. Payment: Cash, Check, Visa/MasterCard. Click here for our Facebook page. 900 East Fairhave Avenue, Burlington, WA 9823. Phone: 360-755-9649. Email: ckinney@ci.burlington.wa.us. A FREE festival featuring old-fashioned harvest season activities including the West Coast's One & Only PUMPKIN PITCH, (see the video here, To register for the team contest, contact the Burlington Parks & Recreation Department at 360 755-9649. )children's entertainment, mule drawn wagon rides, pumpkin weigh-in, food booths, art show, and entertainment. Join us for the Boy Scout pancake Breakfast, Free Family Fun Fest & the Kiwanis Barn Dance. Kids activities including face painting, pumpkin painting, games, bouncyhouse, and zuchinni races. 15505 Westminster Way N., Shoreline, WA. Lynden, WA. Email: lynden@lynden.org. Open: see their website for the exact date. Phone: 360-354-5995. Also, BBQ, music, craft fair, apple and cheese sampling... Everything a Harvest Festival should be! Visitors can travel between downtown and Fairway Center via free hay wagon rides along Front Street on Saturday! 12920 State Route 162 E., East Orting, WA. Phone: (253) 848-7604. Directions: From Puyallup, head east on Pioneer to Hwy. 162 (Sumner-Orting Hwy) and turn right. Continue 3 miles. We're on the right, past 128th St, or call for directions. 15505 Westminster Way N., Snohomish, WA. Snohomish Festival of Pumpkins - late October see their website for the exact date from 10am – 5pm. Fairgrounds off 15th Ave. S.W. and 5th St. S.W., Puyallup, WA. Growers should be at Service gate by 4:45, on the S.W. side of the Fairgrounds. Farmers Market, Coupeville, WA. Unofficial weigh-off only for pumpkins grown on Whidbey Island. For Information, call Lee at 360-675-5687. West Virginia Pumpkin Festival - see their website for the exact date or call for current dates! P O Box 358, Milton, WV 25541. Phone: Correct phone number is unknown (it ois NOT the number that ends in 9222). 2011 was the 26th year for it! Also see this page! 3865 Hwy# 138, Stoughton, WI. We're located between Stoughton and Oregon on Hwy 138, just 20 miles south of Madison. Greenleaf, WI. Does anyone have contact or current information for this event? If so, please write me! Riverside Park, Highway 73 on the east side, Nekoosa, WI. Weigh-off 8am - 10am.